“How is it, that an outstanding…” – in this case young-“… film maker is barely known outside his own country?” To this question, there is generally only ever a single answer, which is: “Out of place. Too different.” Too different from what? Of Edgar Pêra you could certainly say ´too different´ from everything which we regard as ´correct´, ´valid´ within the culture of film, ´realistic´ in a cinematic, socio-political way. Put more precisely: Edgar Pêra its different from everything that we know about Portugal; his cinema has – at a first glance – absolutely nothing in common with Portuguese modernity (de Oliveira, Rocha, Botelho, Costa… are they really as similar as people make out? We would much sooner think them similar, however, than have them be it…). He has nothing at all to do with that Portuguese cinema which people don´t generally wish to know, and absolutely nothing at all to do with the key themes from the Dominant Discourse of international Cinema. On the one hand, yes. But on the other, it is all there somewhere in the Great Luso-Galactic Whole – perhaps Pêra is really the true successor of Portuguese modernity, the master of necessarily different tools, and its salvation from being mused to death. If you look at how agitated so many people became at the last adventurous works of Masters Botelho and Rocha, you can understand that this sorry process is already well and truly under way – and perhaps Pêra´s films have just reached that point which all the rest will have to reach, if they are willing to go that way. Freedom, according to Pêra, is a decision. Not a concept; it is something which people, whether it be in film, as a human being, with subject matter, must constantly tackle in new ways; something which they must constantly make a decision about. And is constructive, absolute denial not perhaps the most sophisticated form of this discourse? Contrary ideas must be shown the deepest respect wherever possible; we should be able to think and feel simultaneously on several levels at all times! Therefore it is quite understandable that `we´ only became aware of Pêra after his first production with a ´realistic´ remit, namely “A Janela (Maryalva mix)”, which Paulo Branco funded, giving the film a bit of a push to get it going – although it was never really enough. It was just too different from anything which had ever been unleashed on the world under the seal of Madragao. Even behind his next, somewhat better-known work, a big name with a certain financial clout is to be found: Contracosta, who have been producing Pedro Costa, produced “O Homem-Teatro”, another prophecy from the first year of the Luso-Galactic millennium, a prophecy which was however only revealed later on (according to Pêra, “O Homem-Teatro” is incidentally nothing less than a “meteoric film impact”). After both these brushes with capital and the Dominant Discourse – to which we should add another Madragao production, “És a nossa Fé” (2004) – Pêra retreated back into his Luso-galactic heteronymity. 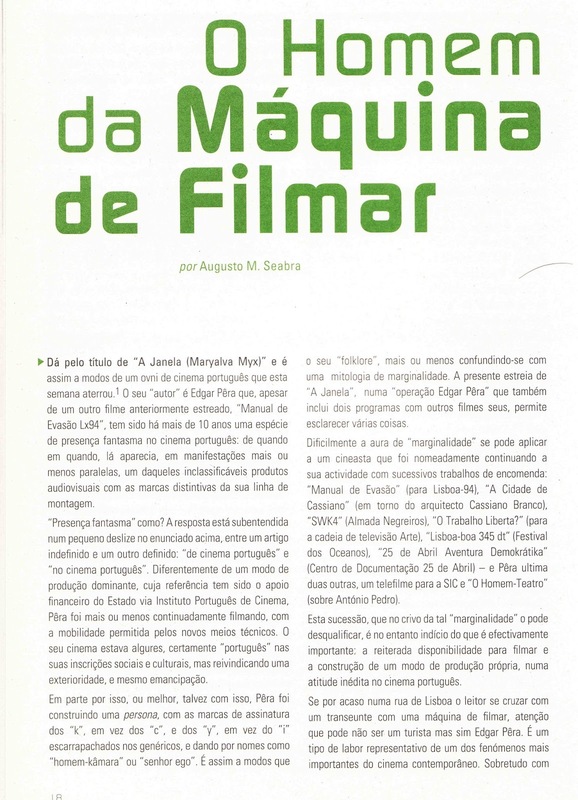 There was already a blip on the Pêra radar in the short film history previous to “A Janela (Maryalva Mix)”; the pointedly titled “O Trabalho Liberta?” (1993) could be sure of controversy at the time of a outpouring of art. (Art is that well-known channel for his sense of culture, where even those editors who don´t know who Robert Bresson is work – something which should not be forgotten!). Various facts about Pêra can be seen as ´realistic´ because they are based on one fact or another about him, and can therefore be equated with ´realism´. 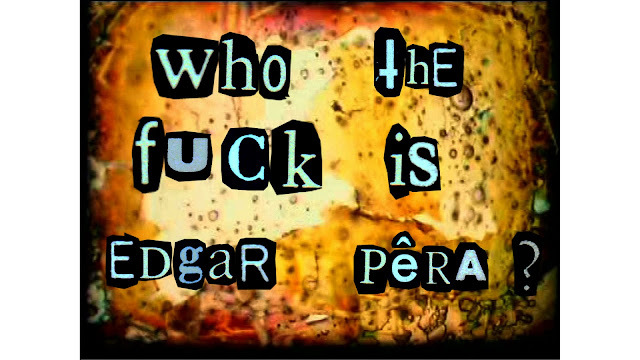 Edgar Pêra was born on 19/11/1960 in Lisbon. In 1981 he left his studies in psychology and devoted himself to cinema. He officially completed his study in film in 1984, though unofficially he continued his studies by making adverts, music videos and such like (at least that is how Pêra sees this period of work: as an apprenticeship). Edgar Pêra cites “A Cidade de Cassiano” as his first film, that is to say, the work where he is totally present as the author. “A Cidade de Cassiano” arose from an exhibition of Cassiano Branco, commissioned by the City of Lisbon. As a rule, Pêra tends to go for these kind of commissioned jobs. In parallel with “A Cidade de Cassiano”, the work “Vita & Obra de Cassiano Branco” also came out at this time. Edgar Pêra ir the spiritual father of the Luso-Galactic world, for which he was revered in the (defunct) Academya Luso-Galaktyka. Edgar Pêra is a master JV. In “Who is The Master Who Makes the Grass Green? (Os Tuneis da Realidade)” (1996), Robert Anton Wilson explains why there is no ´reality´ or ´normality´ in the purely physical sense. Each person perceives the world in a different way. Every brain absorbs only a fraction of the exorbitant wealth of information which confronts us all every second of the day, and then manipulates it. Put simply, the world is just too much for Man, that noble creature in the midst of chaos. Pêra has taken this on board – “A Janela (Maryalva Mix)”, with its self-contradictory tales and all its crazy split-screen compositions, is a lone synthesis of this idea – even if “Who Is The Master Who Makes the Grass Green? (Os Tuneis da Realidade)” does not stand right at the beginning of his oeuvre as a thesis; something does turn up a little later on as another hypothesis in the Luso-Galactic Universe, which is not exactly wanting for such things. That is to say: there is no ´reality´as such. The fact that reality is merely a social consensus was always clear to Pêra, and in fact this consideration determines his whole output; but it is a fact which had to find a voice, and it had to find it through film, to save it from becoming just some authoritative uber – theory flying around. Therefore, cinema verité can only ever be a cinema mentira for Pêra; an image can really only ever lie; and many images, strung together in the conventional manner, can only ever express that social consensus, for all these rules which we simply accept as `realistic´ today, which we quite casually exchange with the words ´true to life´ (the chaotic mass of information, or the individual tunnel of reality?) without a second thought, they are all really just industrial norms based on the developments of the 19th Century. For Pêra, the image – be it on film, tape or microchip – has no worth in itself; in the best case it has a sentimental value which you can start to work with. In his portrait “A Cidade das Pessoas” (1998), the male character´s seemingly spontaneous waving (waving: a classical motif of GradDa and consequently a central image of Veristic cinema) is identified as just a director´s instruction, when a woman suggests to rather stuffy gentleman that he really should start waving already. The image, then, will always be just raw material, which can then be pursued through each particular project, or tunnel of reality (and in some cases the parentheses can be even longer and more convoluted than the main clause…). Apart from “Oito Oito”, in none of Pêra´s key works do images and sounds unfurl in any ´realistic´ way. Everything is in a constant ecstasy; pictures race by in fractions of a second,, sounds are polymorphic and joyful cacophony; they are anything, everything but ´realistic´ in their synchronicity, or even in their very nature. When examined in a purely Luso-Galactic way, even “Oito Oito” proves itself to be a work of high speed, for it is essentially a comic which is speeded up to such an extent that it now seems like a homage to C-Film. 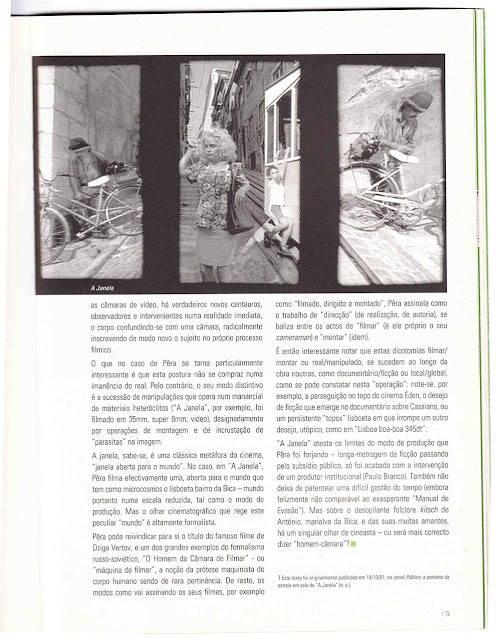 Pêra´s masterpieces of animation “As Desaventuras du Homem-Kâmara / Epizohdyus 111-113 e 115”, “Jardins Subterrâneos” (1998) and “Lisboa-Boa 345DT” (2000) clearly have pace; in fact we should regard all Pêra´s films as animations, for then we would have another rule, another hypothesis which although incorrect, is a good starting point. Which brings us to “Cine-Diaryus du Homem-Kâmara”. When Pêra stylishly crafts a homage to the newsreel, he does it with a camera speed six to twelve times slower than the norm, and so the world looks like a really cool animation where the structure of ´reality´becomes visible, as do the tracks people leave behind in their comings and goings through it. And in that, “Cine Dyaryus du Homem-Kamara” in fact becomes the opposite of the classic newsreel; we are not presented with what has been as a generally acceptable proposition – a kind of truth pulled into ´reality´- but instead, what just was is revealed as what has already passed. ´Reality´s´ consensus: all of us are simply doing what others before us have already done. So, whoever – like Cassiano Branco or António Pedro or the master ie Fernando Pessoa in all his heterogeneous heteronymous power – creates something which no one before him has created, then it remains unreal, or surreal, or hyper-real, the exact word is unimportant, however tangible the house, or the book might be; to become ´real, it must decay within the network of perception, time must make it history, so that it can be ´real´. It simply has to be perceived, artlessly, without anyone thinking anything especial about it. And as we´re on the subject of Branco and Pedro: ´Reality´ demands/creates a lack of ambiguity, and if someone is fascist in 1934 and then socialist in 1948, that messes everything up, everything being the whole immediate future; the only remedy is to move forwards: to say he was a follower or a misguided apostle of politics, an apolitical person, so to speak (or whatever the general consensus on António Pedro is currently). As “O Homem-Teatro” shows, however, Pêra well knows that the real question goes like this: what have fascism and socialism in common with each other that allows someone to pass through them both at different points in time? (let alone the fact that the one, as much as the other ideology,, as much as the ´reality´ expressed through their names, is not static, quite apart from the matter of personal development and growth). In this way, Pêra consistently, insistently hones in on the forms and structures of the early Soviet cinema, and of German Expressionism – both are concentrated in best film-noir style in “A Cidade de Cassiano”; In “Oito Oito”, the whole thing has more of a Z-Trash sharp-wittedness. Premier Vague is paid equal attention – as in “Dia do Musiko” (1998). All these forms have become part of the ´real´cinema culture, but paradoxically are always the ones that know best how to shake up cinema; even though they are sit there quite innocently, they are expressions and memories of scattered awakenings, which, although they have been looted for all they are worth, still possess that socio-cultural-political explosive power; so much so that whenever they are alluded to in whatever way, they still lend a particular purity, a directness, that huge revolutionary power. You could even say that the 20th Century never got the fear of them, the enclosure of demons. “És a nossa Fé” represents another variation on the idea of Cine-Dyaryus as an anti-newsreel; football, which in the form of a ritual is an intensely concentrated dosage of surrealism, which day by day shreds ´reality´. In this case, it is Sporting vs. Leixões, David vs Goliath…. At times football is the only acceptable reality, like cinema, and is observed by Pêra in the spirit of Verism, to end up crossing wires with the fascist past as part of the iconography of Portugal. In this way, football becomes a version of fascism via different means, or rather, fascism alone is a declaration – a ´realisation´of something deeper, which finds its voice in football. If you justapose football euphoria with an array of pictures of Christians mourning a pope´s passing, and pictures of good communists at the burial of one of their own, the chaos of all leftist and rightist myths and paradigms is complete (If you ignore the fact that Pêra would probably have been a football playing communists in a parallel universe). Recognition through ecstasy. If there is a need to boil the Pêra phenomenon down to a single point, then perhaps that is it. His cinema, risen (again?) from the wreck of culture and pop-culture, is a Luso-Galactic Voodoo variation, and appropriately at that, with Pêra as a horse that history and all its many forms ride upon. In the Crowley / Pessoa style “Zombie Town 23” (1998), this voodoo idea is injected into the work, through pictures and quotes, though it was always really a key component. But who are the zombies? The ideas/structures/images of the 20th Century, which the GradDa is steeped in; and therefore every print that is taken from them, every audiovisual project, every work that can be made from them (which the Luso-Galactic World then turns into a transcendent relation of necroreality…) In all this we have to perhaps gain a much deeper understanding of Pêra´s passion for Remix, and Protoremix, and the fragment, his passion for everything which keeps things moving, everything which animates. All this is what keeps the zombies alive, what gives them strength, a presence; it creates them in such a way that they can be experienced, can be considered. And so, just as we are sucked with full force into the reality tunnel of every work, we are spat back out at the end of it; or rather, the pull that Pêra´s works exert, can be experienced and perceived as a retreating moment – as something which mirrors the observer. KINO-NEWS had a free pass to the Neuro-Lab Studio where Cinesapiens is being finished by a very small and very dedicated team. According to one of his close collaborators, Edgar Pêra used “irony and farce as the fuel. Cinesapiens is an astonishing motor of ideas. Everything is both atraccionistic and eccentricionistic: actors, musicians, dancers, they all play to the audience, and the audience plays for us.” But the filmmaker warned “ that’s just one of the ways to look at Cinesapiens. But I agree that it’s a new take on the cinema of the attractions using 3D as the catalyst for kino-novelty”. PÊRA: Yes. You are correct again, young man. I must give you some autographed blu-rays of my films. When someone will publish them, of course.